Geckos, known for their uncanny ability to adhere onto any surface have long been scrutinized for that reason. What makes geckos so interesting is that unlike conventional adhesives, geckos do not use liquid or temperature based adhesives and do not leave any residue on the surfaces they stick to. Because of these unique characteristics, scientists have tried to find the secret behind the uniqueness of gecko feet. Scientists, as early as the late 20th century, have known that geckos use Van der Waals forces to cling onto virtually any surface. Van der Waals forces, the temporary attraction between molecules from dipole moment, are considered among weakest attractive forces known. However, gecko feet are covered in millions of setae, essentially microscopic hairs. These setae greatly increase the surface area of the gecko feet, allowing for the gecko feet to maximize the amount of area touching a surface, regardless if it is smooth or uneven. 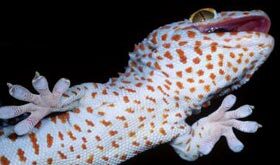 Because the surface area of the gecko feet contacting a surface is increased, the amount of molecules touching the surface also increase. Van der Waals forces, whose strength is based upon however many molecules can interact with each other, with this increase in area, is greatly magnified thus allowing the gecko to adhere to a surface. Ever since the discovery of the science behind gecko feet, engineers have tried to replicate the surface of gecko feet by creating various glues and tapes that use similar concepts to that of the microscopic setae. Gecko glue has proven largely ineffective. Gecko tape on the other hand, has seen much more significant success. Gecko tape, similar to the concept of gecko feet, involves millions of synthetic fibers that imitate the setae of geckos. Granted, the sheer density of gecko setae has not been duplicated, but engineers have developed a density of microscopic synthetic fibers that are sufficient to provide enough attractive force to suspend a full adult man. Initially, in order to support a full adult man, large pads covered in artificial setae were required. However, with the introduction of new technologies capable of manufacturing higher setae density sheets and the development of new materials that result in stronger Van der Waals forces, the size of the sheets required to suspend a man have been greatly decreased. Now what is the significance of the development of gecko tape? Gecko tape provides potential for a new adhesive that can cling onto any surface yet can be removed without any residue. Additionally, gecko tape has an attractive force proportional to the amount of weight it carries, allowing for more stability in adhesive loads. This concept is illustrated in the diagram below. 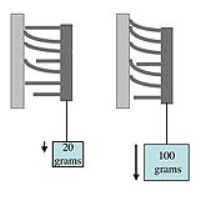 As the load of gecko tape increases, more and more artificial setae contact the surface, increasing the strength of the Van der Waals forces on the tape. This concept also works in reverse. If the direction of the pull is reversed, the tape can be removed from the surface, leaving no residue. If the development of gecko tape reaches maturity, gecko tape has the potential to replace many of the conventional adhesives commonly used today. Evidence for van der Waals adhesion in gecko setae, Kellar Autumn et al., Proc Natl Acad Sci U S A. 2002 September 17; 99(19): 12252–12256. ‘Crazy’ tape holds weight of man, by Jesse Emspak for Discovery News, Nov. 2011. Hi Thomas – I’ve added captions to your images indicating the source. Looks like you were able to find something interesting to post on despite me doing the gliding snakes first =) This stuff is great, I hope it’ll hit mass production fairly soon.